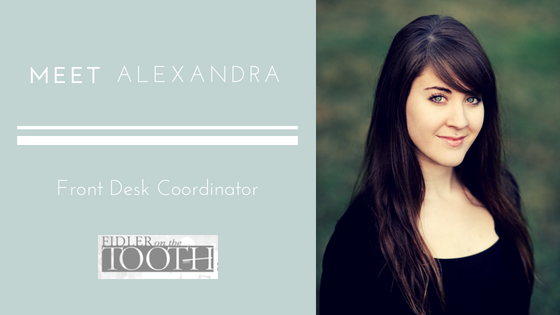 Meet Alexandra, the First Smiling Face You'll See at Your Seattle Dentist! Meet Alexandra, the First Smiling Face You’ll See at Your Seattle Dentist! Going to a new Seattle Dentist can be daunting, but it helps when you see someone with a warm, welcoming smile as soon as you walk in the door. Alexandra is one of our patient care coordinators, and she will usually be the one greeting you as soon as you walk into the office. She has been with Fidler on the Tooth since April of 2016, and many of our patients love her. She is a wonderful addition to our practice for not only is she a genuinely nice person to be around but she’s also a hard worker and will go above and beyond to help you with what you need. What is your position here? What do you do? I am a patient care coordinator, and I take part in scheduling, greeting patients, verifying insurance eligibility and benefits, explaining treatment plans, maintaining communication with other dental specialists, etc. I was thrilled to get this job when I finished college at the University of Washington. What have been some of your favorite moments at work and how has it been different working here than at other companies in the past? My favorite moments at work are when we get to celebrate each other; birthdays, weddings, and other wonderful milestones! I also love talking with, and getting to know interesting things about our patients! Everyone has a story to tell, and I love to listen. In the past, I have specialized in customer service and relations, which is something I have always enjoyed. But here I get to learn about the clinical side of things, which is particularly fascinating because of my background knowledge in biology. What’s your favorite company perk? I love having goals to work towards, and working hard at Fidler on the Tooth equals rewards, including staff outings and vacations! Those are amazing and unique company perks, but truthfully, one of the best things is working with my fantastic coworkers every day. Plus, I get to have my teeth cleaned for free! There’s no greater feeling than having nice, clean teeth! Has anything unique or special happened to you recently? I moved into a new house in June 2018, and it is my favorite place I’ve ever lived! It is truly a home where I am excited to make many beautiful memories. What is one of your unique talents or a shocking fact about you? I have been vegan for nearly 14 years, almost half my life! I am an avid cook and love creating unique and flavorful dishes for anyone and everyone. Spending time with my partner Steven, my sister Mandie, our dogs Leo (13) and Jack (11), and my other family and best friends. I love being outdoors – sailing, rafting, hiking, gardening – but also thoroughly enjoy reading, crafting, and watching movies. Where do you enjoy eating, hanging out, or visiting, and why? My favorite place to eat is in my kitchen, as I have the pleasure of living with amazing chefs! I love to spend time outdoors, whether it be in the city of Seattle or beyond; at parks, beaches, or rivers. I love traveling as well, which allows me to learn more about other people’s cultures, lifestyles, and environments!